Phil's new multimedia program blends the Common Core English Language Arts standards with popular media, American History, and language from diverse cultures. Students read along with historical speeches by John F. Kennedy and Martin Luther King, Jr. Your kids learn how students in Ghana speak and drum phrases in their language. Phil starts with an entertaining multimedia presentation of popular cartoon and movie phrases that exemplify the characteristics of fluent and expressive reading. He then shows the students how to articulate their own ideas clearly and persuasively using seven key strategies. These reading and listening strategies are designed to guide the students through the conventions of oral reading and effective communication. He shows them how to use expression and punctuation for effect, and how to communicate their ideas precisely, by grouping words into phrases. 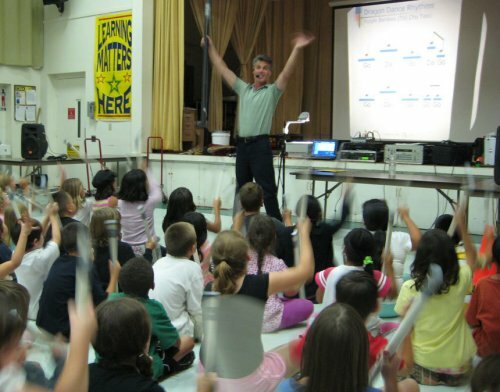 In addition, he integrates a musical approach to language, by connecting reading and speaking to the musical elements of pitch, tempo, and dynamics. Next, Phil applies these key strategies to excerpts from two famous historical speeches from President John F. Kennedy and Dr. Martin Luther King, Jr. With each example, the students hear how these great communicators used expression and phrasing to convey meaning and create shared understanding. The students listen first, and then read along with these two skillful speakers — modeling their reading styles and internalizing the strategies they used. Lastly, Phil connects the Common Core standards on the Craft and Structure of poetry, to music and rhythms from Spain, Mexico, and Cuba. A highlight of the program is when Phil teaches the kids how students in Ghana use meter, verse, and rhythm to communicate phrases effectively in their language, called Twi. Your students learn how to pronounce Twi phrases with proper expression and intonation, and then see and hear how these phrases are integrated in schools throughout Ghana. 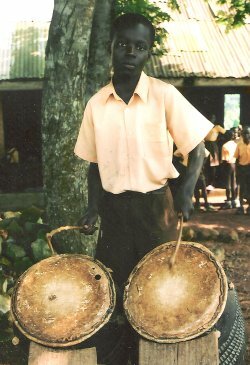 For more on this, please visit: Drum Language in Ghanaian Schools. At the family night, students integrate rhythm and musical instruments with their reading! Get ready to move on this one! Reading in Rhythm begins with an entertaining exploration of the rhythms of language through shared reading, movement, and a variety of Caribbean, African, and Latin American instruments. Next, the students make their own Peruvian rain sticks, African stamping tubes, and Latin American guiros. After everyone finishes, we all join together for a dynamic concert of rhythm and shared reading. In addition, Phil covers the major elements of how parents can read with their children and encourage their children to read through a number of helpful handouts and displays based on Jim Treleases classic, The Read-Aloud Handbook.